I&apos;m attempting a very difficult task...deciding which donuts are my favorite in Cumberland Valley. I know it&apos;s going to be controversial, and not everyone will agree with me, but here we go - my favs! There are so many reasons this place is number one for me. In fact, they inspired this whole blog idea. I&apos;ve been loving Duck D onuts since family trips to the Outer Banks, so when I heard they were coming to Mechanicsburg to say I was excited is an understatement. They do not disappoint either. They are always fresh and warm, and best of all, customizable (see above). From maple bacon to lemon blueberry, they are all delicious! This local favorite is a go-to for specialty cakes and pastries. Little did I know they also offer the "doughssant" a play on the popular cronut. Flaky and delicious, with the perfect filling. These tiny donuts are too cute to leave off the list. I tend to go to the West Shore Farmers Market with plans of leaving with kale and spinach and instead usually leave with a dozen of these guys. So cute...so tasty! 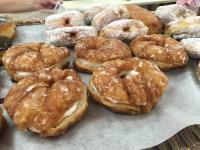 In the fall time, head to Paulus Orchards for a fresh Apple Cider Donut. They combine the fall flavor of apple cider with the richness of donuts. Get there at the right time and enjoy a warm one. 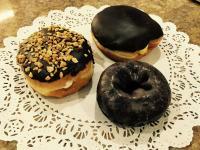 When you need a classic donut, stop by the Carlisle Bakery. 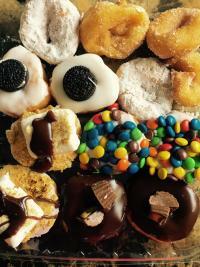 They are made fresh and you can pick from your favorites like Boston Cream and Chocolate Cake donuts.